If inventor Pam Nash is right about Zappa, she could revolutionize law enforcement. If she’s wrong, they’ll kill her daughter. 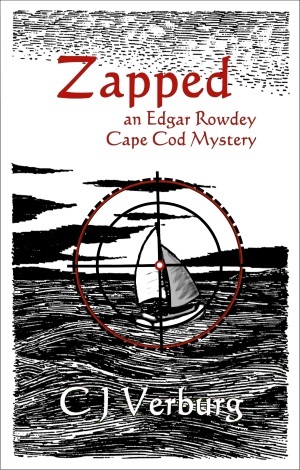 Now you can read ZAPPED: AN EDGAR ROWDEY CAPE COD MYSTERY on your phone, tablet, or computer for just $3.99. Click to see it at Amazon, iTunes, Google Play, Kobo, or Barnes & Noble. Kudos to Rex Stout for grappling with the Poirot Problem: What do you do when your series detective, to whom you whimsically gave an exotic foreign background, becomes so popular that fans demand to know about his past? Agatha Christie created Ariadne Oliver to vent. Stout tops her by killing off Nero Wolfe’s oldest friend, forcing the sedentary sleuth not just out of his house but onto a plane to Montenegro. This has to be the oddest book in the Wolfe/Goodwin series. Nero Wolfe, the legendary couch potato, transformed to a mountain goat? Archie — posing as his son — carries the luggage along with the narrative, which he’s reconstructed after the fact from Wolfe’s translations. I learned more than I could absorb about the geography and politics of that volatile region, which would soon explode into larger wars than the one our sleuths must navigate. The story is action-packed, full of disguises, deceptions, betrayals, and violence, suspenseful all the way back to New York. So, more of a thriller than a Golden Age mystery. No women, except for the occasional glimpsed-from-afar wife or daughter. I enjoyed The Black Mountain, and I’d love to ask Rex Stout how he came to write it, but I’ll be happy to rejoin Wolfe and Goodwin in Manhattan. Happy Halloween! It’s Party Time for ZAPPED & You’re Invited!